Dr. James Kauffman, 68, of Linwood, New Jersey, is charged with murder, 1st-degree racketeering and 1st-degree leader of racketeering. A New Jersey doctor is accused of hiring a man to kill his wife after she planned to divorce him and expose his illegal drug operation with the Pagans motorcycle gang, prosecutors said Tuesday. Dr. James Kauffman, 68, of Linwood, New Jersey, is charged with murder, first-degree racketeering and first-degree leader of racketeering. 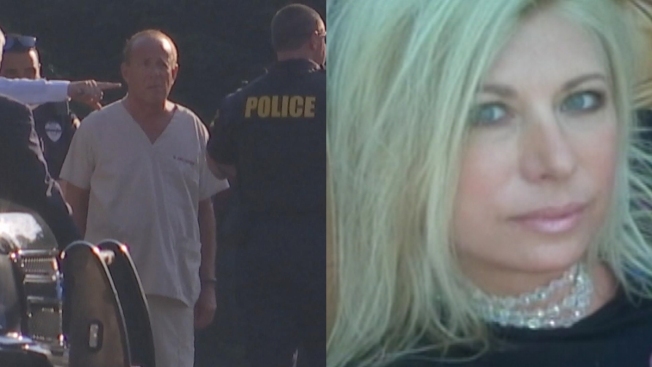 The new charges come more than five years after Kauffman's wife, April Kauffman, a New Jersey radio host, was found shot to death inside their Linwood home. Officers found April Kauffman face down in the second floor bedroom of the couple's Woodstock Drive home on May 10, 2012. The 47-year-old had suffered several gunshot wounds. She was pronounced dead at the scene. A local businesswoman who hosted weekly talk shows and advocated for military veterans, April Kauffman received a governor’s award for outstanding community service a few days before her death. For several years, the killer remained at large despite accusations from April Kauffman's daughter that her stepfather, James Kauffman, was to blame. He denied any involvement at the time and still does now. The reality of the crime was even more than the daughter could have imagined, authorities said. The doctor, according to Atlantic County Prosecutor Damon Tyner, hired a hit man to kill his wife after she threatened to expose his alleged drug enterprise. James Kauffman and 61-year-old Ferdinand Augello, of Petersburg, New Jersey, worked with the Pagans Outlaw Motorcycle Gang to illegally distribute drugs from Kauffman's Egg Harbor Township medical practice, prosecutors said. Investigators allege he wrote free prescriptions for highly sought after and addictive opioids — including Percocet, Oxycontin and Oxycodone — to people who were sent to his office by Augello. Augello allegedly received $1,000 in cash per prescription or a predetermined number of prescription pills once the script was filled. Those who did not have insurance were required to pay anywhere between $100 to $250 per visit, according to investigators. Tyner said April Kauffman learned of the operation in 2011 around the same time she planned to file for divorce from James. "She threatened to use this as leverage to expose him to gain a favorable divorce settlement," Tyner said. With his self-described "financial empire" in jeopardy, James Kauffman and Augello began propositioning several people to murder April Kauffman, according to Tyner. For a year, they were unsuccessful. Then, in 2012, Augello found Francis "Frank" Mullholland, Tyner said. During the early morning hours of May 10, 2012, Frank Mullholland received a ride to the Kauffman home and was given a gun. He then allegedly went inside the home through an unlocked door and shot April Kauffman twice before leaving, according to investigators. After the killing, Mullholland received an unknown payment from a member of the motorcycle gang, according to officials. Mullholland said he received around $20,000 in cash though investigators speculate the amount was higher. Mullholland was found dead 18 months later. Investigators at the time said the manner of death was an accidental drug overdose. James Kauffman's drug operation continued for five years after his wife's murder, officials said. Every person involved in the enterprise was either a Pagan, former Pagan or an associate of a Pagan, according to investigators. The operation finally folded when James Kauffman was arrested on weapons charges following a standoff with police at his Egg Harbor Township medical office on June 13, 2017. Atlantic County investigators, the FBI and local police officers searched his home and office that day as part of a wider probe into alleged prescription fraud in the Atlantic City area. During the search at his medical practice, James Kauffman allegedly confronted the officers while brandishing a Ruger 9mm handgun. The man yelled, "I'm not going to jail for this," as officers worked to take him into custody, police body camera footage obtained by NBC10 showed. James Kauffman eventually surrendered and was taken for a psychological examination. He was jailed on weapons charges and has remained in custody at the Atlantic County Justice Facility since that incident. For years, April Kauffman's daughter Kimberly Pack said her stepfather was responsible for the murder and pressured prosecutors to keep the case open. In 2014, she filed a lawsuit stating James Kauffman was "responsible for the intentional killing" of her mother and that he should not get the $600,000 in life insurance money he had sought. "This is a really emotional day," Pack said during a news conference Tuesday. "My mom used to say the squeaky wheel gets the most oil, and I feel like that is definitely true here." Pack's lawsuit is still pending. Ed Jacobs, James Kauffman's attorney, said his client is "innocent." "I can tell you putting it in writing doesn't change anything. He is innocent of any complicity in his wife's murder before this indictment. He is innocent still," Jacobs said. In addition to Kauffman, police also arrested Ferdinand Augello; Joseph Mulholland (no relation to Frank Mullholland), 52, of Villas, New Jersey; Beverly Augello; Glenn Seeler, 37, of Sanford, North Carolina; Paul Pagano, 61, of Egg Harbor Township; Tabitha Chapman, 35, of Absecon, New Jersey; and Cheryl Pizza, 36, of Murrells Inlet, South Carolina. Ferdinand Augello is charged with first-degree racketeering, first-degree leader of racketeering, the first-degree murder of April Kauffman and conspiracy to commit the murder of James Kauffman. The remaining six suspects are all charged with racketeering.